With physical copies of my book now available through major book sellers, the opportunities available to me have been broadening. I don’t really see myself as a salesman or a retailer, but I’ve made it a habit of carrying a couple of copies with me wherever I go, because I just never know who might be interested in picking one up. And so far this has proven to be the most effective way of selling my book. I have started speaking more at various events, and I’m excited to be able to share with different audiences. I have been experiencing a bit of time dilation as of late, and February now feels like it was a long time ago. 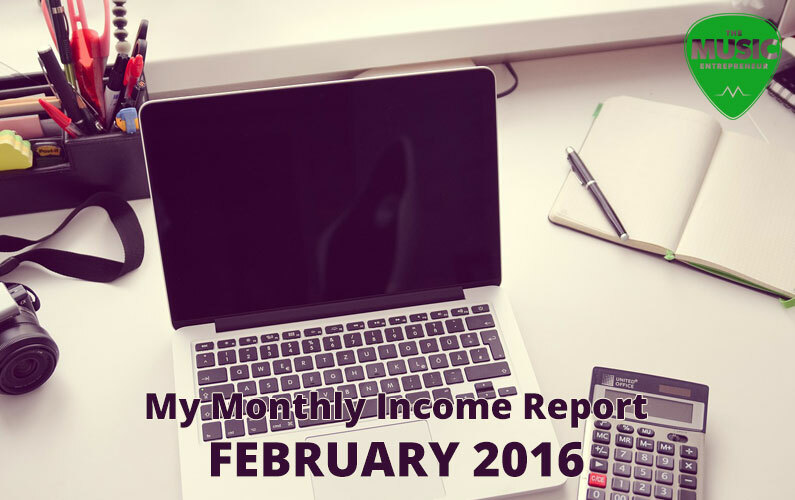 There have been a couple of crazy weeks between now and my last income report, and I think my income from February reflects this too. But all in all February was a productive month. I’m also excited for what’s ahead. As I’ve said before, I’m no accountant. In fact, beyond keeping a ledger or all of my income, I’m usually scrambling around tax seasons to comb through emails to find all of my expenses. Sadly, this is no different this year. But there are a few things you’ll want to know about these numbers. You can also find a more detailed explanation in my first income report. Basically, I only post my music-related income here, and it’s all in Canadian dollars. As I debrief for another month, I’m struck by how little outsourcing I’m actually doing. I don’t know if you guys care to hear about the strategic aspect of my business (but hey, this is The Music Entrepreneur), but I feel I should be delegating more work, especially as it pertains to design, editing, uploading media to other sites, and managing WordPress. Another thing that came to mind was just that I should be building more local connections with bloggers, podcasters, media outlets, and the like. Earlier today, I was thinking about my two major pain points: marketing and revenue (you can see that most of the money I make doesn’t come directly from this site). I’m coming to realize that I could be doing a better job of appearing in different places both online and off. So there you have it. If you’d like to view last month’s income report, click here.